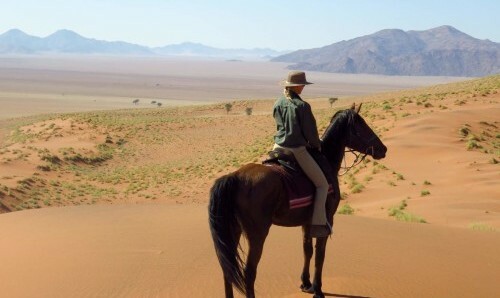 Horse riding in Botswana is always a breathtaking experience, but riding across the Makgadikgadi Salt Pans and the Kalahari Desert is something truly special and unique. Ride out across the vast open landscapes, taking in the stillness and serene quiet of the untouched and pristine savanna islands that break up the mysterious salt pans. 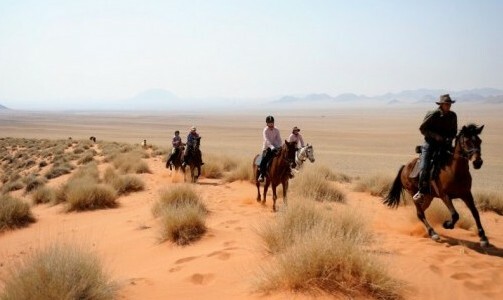 Despite being classed as a desert landscape, this ride takes you through very diverse scenery. Encounter wide open plains, denser scrub land, stark and barren salt pans and an array of desert-adapted flora and fauna such as wildebeest, zebra, elephant, a morning spent with the curious meerkats and many more. You will be given the unique opportunity to learn about this intriguing landscape from an afternoon spent with the Kalahari Bushmen, who have lived of the land for many years and know all the secrets of life in the desert. Follow in the footsteps of David Livingstone as you recreate a stretch of his journey across Botswana, stopping for lunch by the iconic baobab tree that Livingstone used as a landmark. Guided by the brilliant ‘bush-guru’ David Foot, you will leave Botswana with a much greater understanding, love and appreciation of the African bush – you can’t help but be infected by David’s passion for it. A horse safari across the Makgadikgadi combines the wonderful luxuries of a beautiful tented base camp, with a true bush experience. The mid-stay three day excursion from your luxury base camp allows you to experience a night of fly-camping like the original pioneers; nestled in the bush with campfires, bucket showers, alfresco dining and the wonderful sounds of an African night. Spend a night sleeping far out on the salt pans. Set out onto the pan in the wonderful afternoon light of an African dusk, and after the sun has finished setting the white salt alight with colour, ride on into the night. 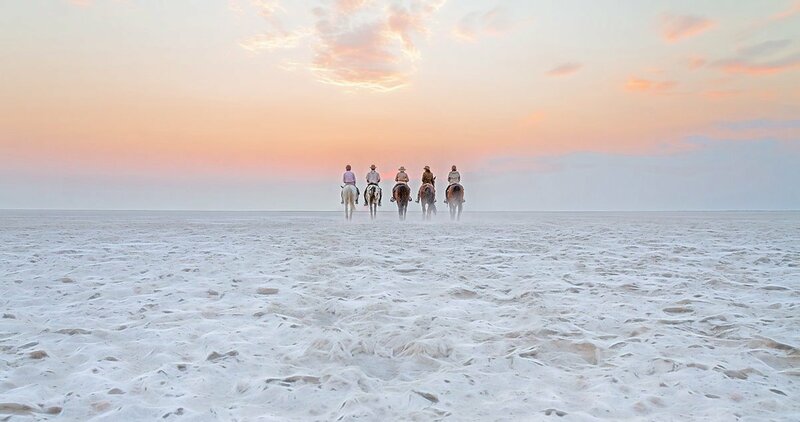 The surface of the Makgadikgadi Salt Pans is so perfectly designed for horse riding you will encounter the unique thrill of cantering through the darkness, with only the light of the stars, moon and distant campfire to guide you – a truly surreal experience. That night sleep out on a camp bed under the unparalleled stars of an unpolluted African sky. Revel in feeling like the only people in the world, with your horses tethered up beside you and salt pan in all directions as far as the eye can see. Waking up to the sun rising over this moonscape is unbelievable. 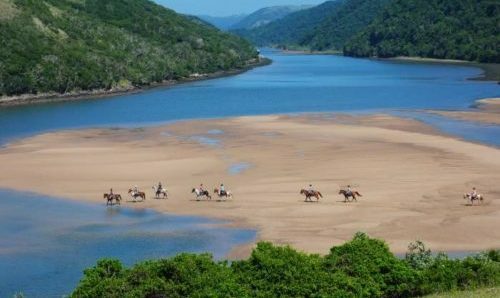 Spectacular sunrises and sunsets, diverse and vast landscapes, intriguing flora and wildlife, sleeping under the stars, thrilling canters across the best natural riding surface in the world and excellent and personal guiding from David, makes for an unforgettable riding holiday. The Makgadikgadi salt pan is in north-eastern Bostwana and located in the middle of the dry savanna that covers the area. The pan is one of the largest salt flats in the world and is all that remains of the former Lake Makgadikgadi, which once covered an area larger than Switzerland. The lake dried up several thousand years ago and lies southeast of the Okavango Delta, surrounded by the Kalahari Desert. The Makgadikgadi Salt Pans are not a single pan but a jigsaw of pans with several sandy desert lands in between. The largest individual pan is about 1,900 sq miles. The pans have a dry salty clay crust most of the year, but are seasonally covered with water and grass. They then become a refuge for a wide range of birds and animals in this very arid part of the world. Encompassing nearly all of Botswana, more than half of Namibia, parts of South Africa, and stretching a vast 360,000 square miles; the Kalahari Desert is not a desert in the strictest sense of the word. 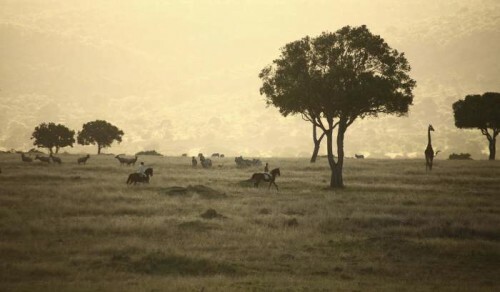 This huge expanse of land has vastly varying environments; encompassing large areas of land receiving between 5 to 10 inches of rainfall annually and wetlands such as the Okavango River Delta, as well as large expanses of sand and areas that live up to the “thirstland” that early European settlers described. The beautiful area is home to a huge array of desert-adapted flora and fauna, with most being migratory animals, calling the Kalahari home during the wet season and when there is adequate water is present. Please be aware this is a sample itinerary. This sample itinerary is for the DRY SEASON - the green season has a different itinerary as it does not include a sleep-out on the salt pans (they are full of water!). Please enquire for the GREEN SEASON sample itinerary. Any changes to the dry season sample intinerary will always be made with your best interests in mind. Day 1: Arrive by air or road into the Kalahari, where you will be welcomed by your host and guide David Foot, and settled into your base Camp Kalahari. Camp is situated among the acacias and Mokolwane palms of Brown Hyaena Island, on the edge of the Makgadikgadi Salt Pans, adjacent to the Makgadikgadi-Nxai Pans National Park, Botswana. After a steaming cup of tea – or refreshing G&T, the chance for a cool off in the swimming pool or a relaxing siesta; head out for your first ride across the vast landscape in the beautiful light of African dusk. Get to know what will soon be your faithful four-legged companion and take in the peaceful essence of the Kalahari. Ride over the jigsaw of savanna islands and salt pans, keeping a keen eye out for any game. Pull up to a beautiful sundowner spot, dismount and enjoy an iconic African sunset wash the sky with red, and listen to the rare purity of absolute silence. Return to camp for a delicious dinner and to kraal the horses close by, before the lions of the Kalahari commence their nightly prowling. Day 2: After rising to a glorious African morning, head out at sunrise and explore this magical area once more. Bathed in the light of dawn, the yellow grasses look even more beautiful. Seek out the desert adapted wildlife such as elephant, zebra and wildebeest as you traverse the ‘land of a thousand islands’. At the height of the migration season, the islands and adjoining grasslands are awash with zebra, wildebeest, hartebeest and ostrich – and of course the attendant predators! Stranded on the ancient lake-bed, these sand dunes dotted with towering palm trees, are one of the most beautiful and fascinating features of the Botswana wilderness. The white salt pans separating the islands makes great going for the horses and provides ample opportunity to pick up the pace. Return for a well-deserved lunch and to shelter from the heat of the day by relaxing in the pool, keeping an eye out for any elephant that might be looking for a drink! 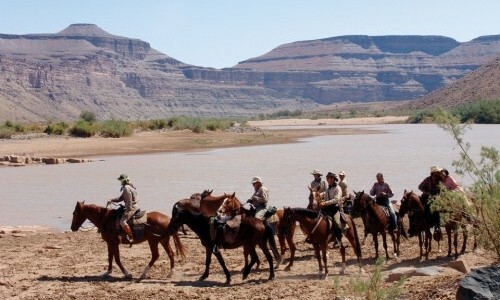 In the afternoon, swap horse for vehicle and take a game drive in search of some of the areas treasures such as; springbok, gemsbok, red hartebeest, bachelor herds of bull elephant and the elusive brown hyena. After sunset, enjoy a night game drive back to camp, and with the aid of a spot light, look for nocturnal desert inhabitants such as aardvark, bat eared foxes, aardwolves, porcupine, honey badgers and perhaps even a black maned Kalahari lion. Day 3: Today is a long ride eastwards to Xau Xai Fly Camp, so an early start is imperative. Be sure to pack a few essentials for the next two days of adventure. 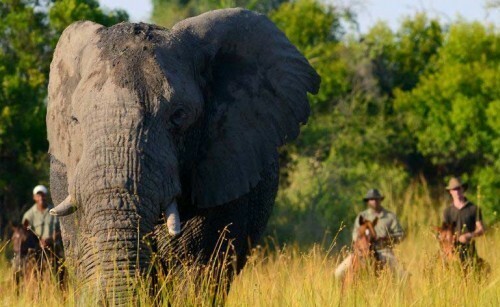 The journey takes you away from the edge of the pans and through the mopane and acacia woodlands, interspersed with short grasslands allowing for lovely long canters. Whilst the area is rich in birds of prey, bustards, korhaans and numerous other unusual dry woodland bird species; there is also a chance that we will sight kudu and the odd elephant bull. Pass by the famous Green’s Baobab, proudly positioned alongside the well- travelled Missionary Road, traversed by David Livingstone on his journeys northwards. The magnificent trunk of this ancient tree is scarred with the initials of early travellers dating back some 150 years thus providing a living testimony to the rich history of this area. Break for lunch at the adjacent Gutsa Pan under a stand of palm trees where you may find Stone Age artefacts and the hunting blinds used over millennium by the Bushmen. Not only is a beautiful lunch spread laid out, but camp beds are also set up in the shade for a blissful afternoon siesta. 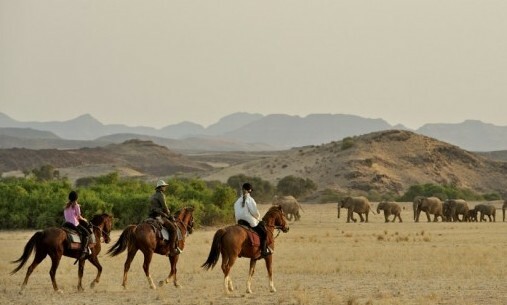 Later that afternoon, continue the journey through the beautiful evening light and on to Xau Xai Fly Camp. The camp is made up of comfortable dome tents, a central mess tent, loos and bucket showers. Ride into camp and be welcomed by a cool drink as you watch the sunset. Enjoy alfresco dining out under the magnificent Kalahari sky. Day 4: Wake up to a steaming hot cup of tea or coffee and a light breakfast, before heading off in search of some of the Kalahari’s most fascinating inhabitants, the meerkats. 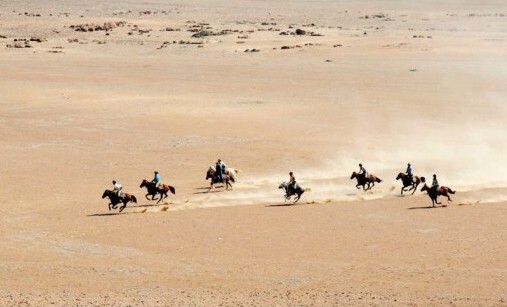 With your horses tethered you can proceed on foot in to the midst of the group. Due to an ongoing habituation programme by Uncharted Africa Safari co. it’s possible to get up close and personal with these captivating creatures. They are not tame – just used to the non-threatening presence of humans. On chilly mornings, you might well find a meerkat snuggling up to you for warmth. 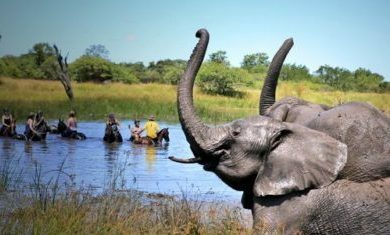 Or, in the absence of a termite mound or tree, using your head as a sentry lookout post… Visiting these interesting animals is definitely one of the most special and memorable game experiences you will encounter in Botswana. As the day warms up, remount and head out onto the pans for some fun! Step out onto the largest stretch of naturally made race surface in the world. Looking out across the vast nothingness and open space of white, it would be difficult not to take advantage and experience the ultimate sense of freedom as you fly across it! Return to Xau Xai for lunch and a refreshing shower, before you set out on one of the best adventures imaginable. As dusk starts to hit, ride straight out into the middle of the ancient lake-bed, eventually reaching a point where all that can be seen is the vast flatness stretching in every direction. Watch the sun set, turning the salt beautiful shades of red and orange and the darkness start to reveal the stars – the perfect setting for an unbelievable photo shoot! Trust the white reflective surface, lit up by the spectacular stars and moon, as you canter through the darkness with only the light of the distant camp fire to guide you. Riding in the dark under the vast sky of stars, with pan in every direction, you feel like you could be the only people in the world. This is one of the only places in the world where the silence is so complete you can hear the blood circulating through your ears. Reach camp, far out in the middle of the pan and enjoy a delicious dinner. Then spend the evening sitting out around the fire and staring upwards at the unbelievable sky. Tuck into cosy bed rolls and sleep under the bright African stars – a night you will never forget. Day 5: Wake on the moon! Rise to yet another beautiful sunrise and surreal breakfast out on the pan. Head homewards, directly across the pans to Camp Kalahari. As the sun dips below the horizon and the last light fades, you will be sure to dwell on the amazing past few days. 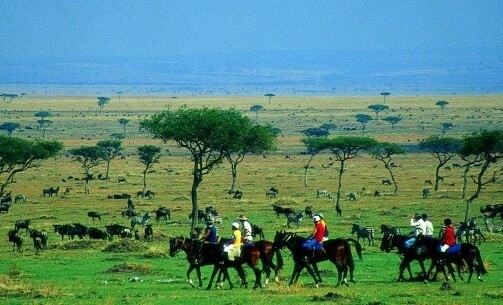 Incredible scenery, memorable wildlife encounters and above all superb riding! Day 6: Visit the Kalahari Bushmen. Uncharted Africa has pioneered and passionately supported cultural tourism in Botswana since the company’s inception in 1993. It has long been their belief that it is a vitally important tool in terms of preserving this unique, but sadly fast-vanishing, culture. Offering a window into the past, an experience with the Bushmen offers an insight into how they have survived in this harshest of environments, using their vast and ancient knowledge of plants, animal behaviour and survival skills. The Zu/’hoasi lead a semi-traditional lifestyle, and share their traditional hunting and food-gathering skills as well as how they make jewelry and hunting equipment, it is a glimpse into their traditional way of life, but by no means an attempt to keep them frozen in time. Through the initiative, a community is able to work together and share their knowledge with each other and our guests, allowing the older generation to pass the knowledge on to the next generation. Also possible to transfer via vehicle for $350pp. Single tents are available but will incur a single supplement. There is thatched central library, living and dining area, featuring an eclectic mix of original African furniture and textiles paired with traditional campaign style pieces and colonial antiques. It provides the perfect area in which to relax and enjoy the serenity of this enchanting area. Cool off in the swimming pool or enjoy a siesta in the thatched pavilion. You will sleep under the stars on comfortable camp beds with cotton sheet and warm blankets. There is a drop-loo and basin.